So, is this a zebra crossing, or not? I’m confused. Is this a zebra crossing, or not? This is the corner of Nicholson and Droop Streets, in Footscray. It appears the lights were originally a conventional non-zebra crossing when the road was narrowed a few years ago. But with only a single lane of traffic (which very rarely gets a green), and few vehicles actually using it, few pedestrians bothered to press the button and wait. It’s not helped by the red man being the default. At many locations, this included, making the green default would make more sense. I think about a year ago they painted zebra crossing lines as well. Now it doesn’t make sense. Are you meant to wait for the green man, or not? Perhaps they still need the cars coming out of Nicholson Street to wait for a green, but there must be some other combination of markings they could use that isn’t contradictory. Removing the zebra stripes and making the green man the default, unless a vehicle activates the green light against it, would probably be the logical thing here. Are there other spots like this with confusing and/or contradictory road markings? ← Previous Previous post: Can you spot the problem here? More confusion on line marking – there doesn’t appear to be the normal Stop line prior to the lights for vehicles in Nicholson St.
Chappter 4 of Volume 1 of the traffic engineering manual covers pedestrian facilities. There are a few interesting bits in it. 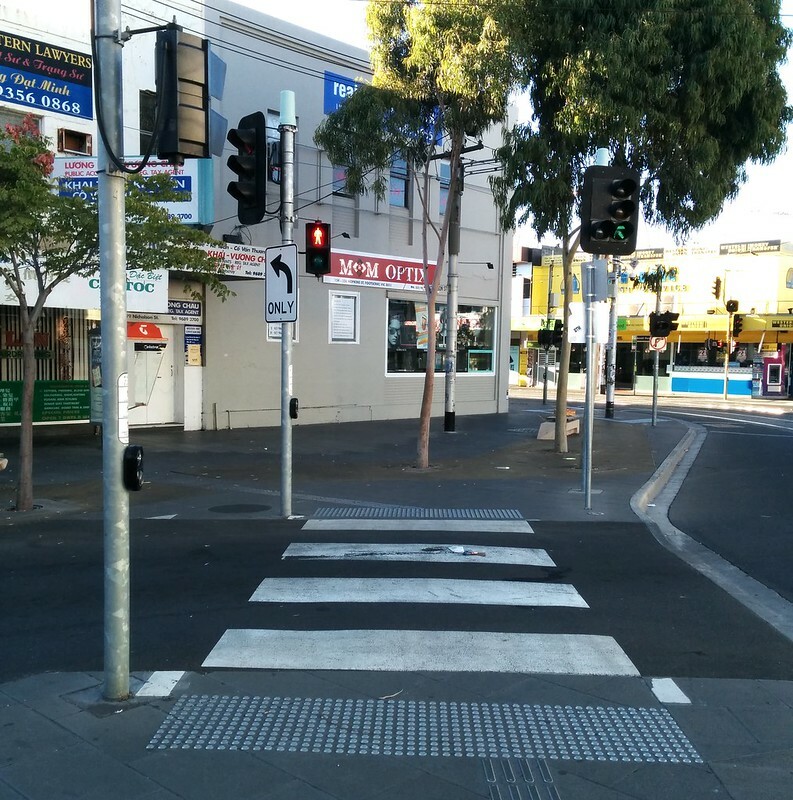 Pedestrian crossings without flashing lights are Major Traffic Control Items requiring VicRoads approval for their installation, removal or alteration. The pedestrian crossing sign (walking legs) must only be used in conjunction with the white striped linemarking on the pavement of the road crossing as defined in Road Rule 81(3). There must be a sign on both sides of the road facing each approach. Road Rules – Victoria requires that if a driver is turning left using a slip lane, the driver must give way to any pedestrian on the slip lane. It is considered that this rule should provide adequate protection for pedestrians crossing low volume left turn slip lanes without the need for any supporting signs or road markings. Unfortunately its very easy to just paint lines on the road without the correct attention being paid leading to situations like the one you have shown above with non compliant crossings which could lead to unfortunate and avoidable accidents. I wonder how many zebra crossings in carparks have been refered to VicRoads and have the appropriate signs etc. It should probably just be a crossing with no lights or pavement markings. We often overcrowd our road spaces with signs, pavement markings etc. when they are often not required and just cause more clutter and confusion. The problem with car detection can be that faulty loops and smaller vehicles like motor bikes sometimes require a back up timed phase to also run. Interesting link (the VicRoads one). I got distracted by the bicycle facility stuff; it’s interesting that it hasn’t been updated in 15 years, and actually codifies some terrible ideas. No wonder councils keep making bad infrastructure, in some cases it seems they’re required to. As for the confusing intersection above, surely that isn’t conforming to any standard. Which really makes you wonder — how does a design like that actually get through a council process? Have you asked Maribyrnong Council about it? The intersection of Flinders Lane and Spring St got the lights downgrade (from zebra crossing) a while back, and the light default was no pedestrian green. Very frustrating given it’s about 3m wide – people would just cross against the light (and presumably, Mr/Ms Police would book them for jaywalking instead of the red light runners). I had a failed attempt to get Melbourne City Council to make a default pedestrian green, given volume at that location, and then success when I tried again almost a year later (it’s now default green at least 7-7, Monday to Friday). Not sure why more lights can’t automatically include a default pedestrian phase, with the button press extending it for infirm, etc. Another silly new signalled crossing is for the tiny laneway (Caledonian ln) for delivery trucks to Emporium. Default red for peds, and even while road traffic along Lonsdale gets a green, peds do not. I have probably crossed at this very crossing. This crossing is so short that most people would probably just cross it without pressing the button and waiting for a green man. If I see that I can safely cross a street I usually don’t bother pressing the button and then waiting for a green man. This includes St. Kilda Rd. and Flinders St. if there are not too many cars as is often the case before 7 AM when I go to work. While I know that this is technically J walking I have never been stopped. This is probably a left over habit from crossing streets in the US for so many years. In the US crossing buttons are not nearly as common as they are here and nearly all of the ones that they do have over there don’t light up or beep to let the user know that they have activated the process to change the lights. Unlike in Australia pushing a US crossing button usually seems to have no effect on how fast the light changes. While the lines painted on the road and signals give the impression that pedestrians should press the button and wait for the green man, in the streetview link above you can see a sign on the left with “Give way to pedestrians”. So who gives way to who then? I’ve been in situations where motorists will sit there giving way to pedestrians, whom will refuse to cross until they get their green man or else they’d be jay-walking. So everyone sits there confused until the lights change. Hi Simon Russsell its possible the more recently introduced AustRoads Guide to Road Design Part 6a (Pedestrian and Cyclist Paths) and the VicRoads Supplement have covered off on some of the cyclist issues in more detail/more appropriately.